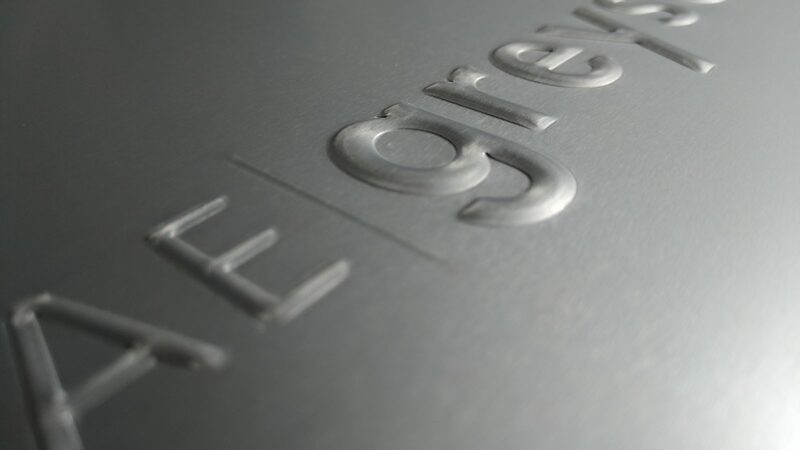 Over the years, we've spent a lot of time refining our technique for stamping names and logos onto our aluminum books and boxes. The effort was worthwhile as we are now able to stamp art, small and large, onto a variety of our aluminum products quickly and affordably. Using a 17-ton press that we purchased from a sheet metal fabrication house that was forced out of San Francisco and a proprietary male/female die system that we developed, we now have the ability to create three-dimensional renderings of names and logos. The results are nothing short of spectacular. But there are two limitations to consider. First among them is that, once stamped, the books or boxes are no longer stackable because of the raised print. For this reason, the process is ideal for products that will be distributed individually and not used in sets. Second, the larger the art, the more prone to "oil-canning" the stamping will be. If you've ever used an oil can and watched the flat bottom spring up and down, you know what I'm referring to. This is not an issue with small artwork, but once the art gets large and a lot of material is being moved around, it can be a problem. The best art for this process has no fine lines or broad areas of coverage and the maximum overall art size that our equipment can accommodate is 4" x 8". Give us a ring if you're interested in learning more about metal stamping and well gladly walk you through the process.